SeoToaster is the most advanced SEO CMS out of the box, it augments websites search engine visibility and makes your life easier in the process. As such, SeoToaster links automatically keywords and key-phrases to corresponding pages within and outside of your website. Creating deep-links for your website is easy with SeoToaster . Go to the SEO tab in the control panel and select "Deeplinks". Choose an "Anchor text" for your deep link. It could be one keyword or a key-phrase. 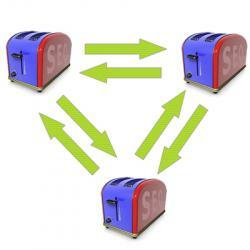 Select a page to link to either an internal page, or another website altogether. Voila. From now on, any time SeoToaster detects your specified anchor text, a link is created automatically for your convenience. For our SEO experts friends; note that a link is created with only the first occurence of a keyword found on any given page, and that titles and some other elements won't be linked. With an optional SeoSamba inbound marketing software subscription this feature gets even better as links are then created automatically by the system based on your website content. No need to specify anchor texts, just create or modify your web pages content and your entire linking structure follows suit. Of course, just like with SeoToaster, you keep complete control over final results and can opt out from creating deep-links automatically suggested by SeoSamba . In addition, deep links are then created automatically across domains of your entire portfolio of websites when managed through SeoSamba.